Heat water in a sauté pan to boiling. Add 2-3 drops of vegetable oil to the water. Place the brussels sprouts in the water, turn the heat down to medium and cook for approximately 5 minutes. Drain the brussels sprouts and place immediately in ice water to stop the cooking process. When cooled down, drain the water off the brussels sprouts. 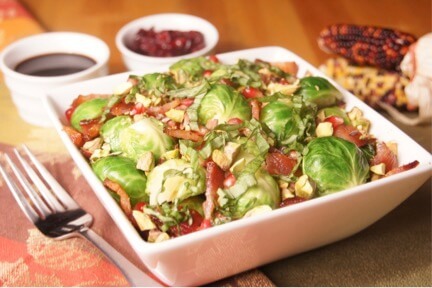 To finish preparation, melt the butter in a sauté pan and add the cooked bacon pieces and the drained Brussels sprouts. Heat for 2-3 minutes or until the brussels sprouts are heated through. Add the pistachios and the pomegranates, season to taste with salt and pepper and heat for an additional 1 minute. To serve, place the brussels sprouts in a serving dish, sprinkle with fresh thyme and finish with a very light drizzle of balsamic vinegar (to taste).